Monday, August 23, marked the last day of travel for the Great Nova Scotia Road Trip of 2010. G & I left Portland with heavy hearts (Zoe slept all night curled up between us, the perfect tiny Jack Russell bedmate) and hit the road around 5:30/6 am for the final 13 hours or so back to Roanoke. The drive was uneventful, but by the time lunch time passed us by, we were starving and ready to eat at almost any seemingly appetizing restaurant we passed. Thankfully I have the internet that goes anywhere in the US (a USB hookup through Verizon), so I pulled up Yelp while G drove South. We were within an hour of Harrisburg, PA, so I started typing in different choices, finally landing on a search for “Vietnamese.” Did you know that there are 800 million Vietnamese restaurants in Harrisburg of all places?! Ok, so maybe not 800 million, but we had our choices, and with all of them rated four to four-and-a-half stars I decided to randomly choose one: Ninh Kieu. Guaranteed to be open at the random hour of 4 pm, Ninh Kieuh’s reviews ranged from ” Mr Pham’s pho is fantastic- always intensely flavorful and packed with goodies” to “Service stinks,” but our experience there was beyond wonderful. I can understand how at a busy lunch or dinner hour the service could be subpar there, there are appears to only be one or two other people working in the restaurant besides the owner (who gives children with straight A’s a free meal, serves 1 cent Pho on Wednesdays for the unemployed), but since G & I were the only people in the place, we were served our food quickly and our water glasses never emptied. 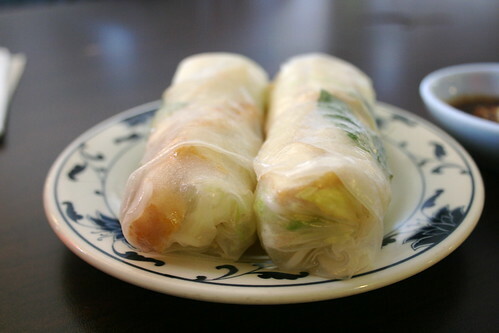 For a starter we ordered the tofu spring rolls: tofu, vermicelli, lettuce, herbs wrapped in spring roll wrappers and served with a peanut sauce. Super good. The ratio of vegetables to tofu to herbs was just right (and not too overpowering on the herbs, which is a problem I often encounter with Vietnamese cooking). It was hard to not just scarf these down too quickly. For the main course, I ordered a bowl of something I think was called Spicy Tofu Soup (I could be wrong…not sure). If I remember correctly from the menu, vegetarian pho was available, but I wanted a little more heat inherent in the soup itself. This dish deserves 5 stars. It was hot and spicy and noodly with tofu and veggies mixed in–just perfect for anyone starving and needing a good pick me up on the road. Plus I can only imagine how good it would be in the winter. So hot and satisfying. And huge! I ate about half the soup and when I asked for a container to-go, the owner put it in a large styrofoam cup with a lid, tapped the lid onto the cup, taped the cup to a piece of cardboard, and then wrapped it all in a plastic bag. Maybe not the most environmentally friendly, but the soup made it all the way home without spilling! In my opinion, A++ for service! I even had enough leftover that G & I split it for dinner when we got home. For $7 a bowl, you definitely can’t beat it. When we finally made it back to Roanoke around 9 pm, we were exhausted, but not so stoked to be back. 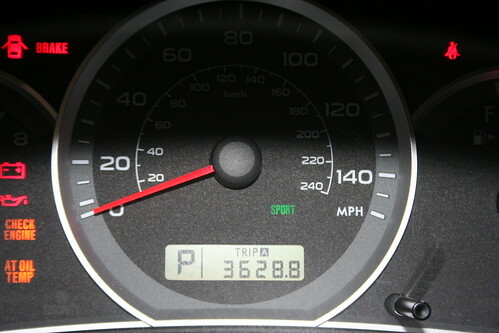 And yes, that’s the photo I took right before we turned the rental car in: 3,628 miles round-trip. We spent over 60 hours driving in the car, according to the GPS. Wow. And we definitely traveled more miles since we crossed from New Brunswick to Nova Scotia on the ferry at the beginning of the trip. It was crazy, but so worth it. I’ve been home for a month now trying to get my life into order and succeeding only minorly. I’ve been traveling more these days, just got back from Philly last weekend, heading to Charlottesville this weekend, Richmond the next. Life’s too short to stay in one place. Especially when your cabin doesn’t have water. Am I glad I did it? Goodness yes! The reason I went–to present a paper–was excellent. I definitely made some good contacts, got my work exposed some more, developed a few more thought trails to explore in my research. But the main reason I’m glad I went is because it was life changing in a way I never expected. Something happened up there and it switched my entire perspective on life from stressed and anxious to peaceful and ready to face whatever comes my way. I can’t explain it; it was a bit like a religious experience. And for some unknown reason, driving almost 4,000 miles doesn’t feel like that much anymore. 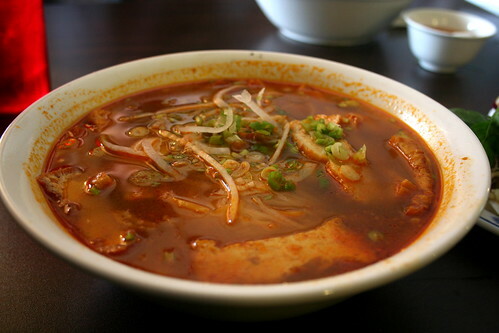 That spicy tofu soup looks so amazing. Like, my dream soup. Glad you had a good trip! That soup looks amazing, and it reminds me I should make a trip back to the Vietnamese restaurant that was near our old house. I’d forgotten how great it was. Also, you should do a post on trying to make that soup! I’m exhausted just thinking about your recent life! Especially dealing with not having water – I’d go insane. If Roanoke was hit with what we’re going through in Northern Virginia this morning, hopefully you’ve collected a bunch of water to help you out for a while. Yum, I’m all over those spring rolls! They look so fresh and light… now I really want to make some, too. Wow! What a great trip! It looks like you topped it off with one of the best meals! It certainly did look like an awesome trip! Glad you’ve found some peace in life, too! That restaurant looks and sounds amazing! Inexpensive meals for the unemployed, free meals for straight A kids!?!?! That is AWESOME! Not only that, but the food looks ridiculously delicious. I haven’t had Vietnamese food in so long, too long! 800 million Vietnamese restaurants? That’s a lot! That soup does look beyond delicious! I would have wanted to take it home with me too. So good food + religious experience. Yep. That’s a good trip! Well, that meal in itself looks like a religious experience! I’m so glad to hear that your trip was beneficial for you—it’s amazing how road trips can do that sometimes. Often, I think, getting away from our daily lives does give us a whole new perspective. I think maybe Tom and I need us a roadtrip. makes me hungry and craving for rolls. Hate to tell you, but I live in HBG, and wanted to try the soup after reading your post, but I called the restaurant, and asked if they could make any of their soups without meat stock, and they said no. I specifically then asked about this soup, and they said it contained meat stock. Thought I should post for any other vegans that read this site, cause it comes up when you google vegan and Harrisburg. Sorry for let down, I haven’t found a single place in HBG that has vegan pho of any kind. Oh no, that’s terrible!!! I wonder if something has changed over the years or if they just didn’t tell me the correct info. Back in 2010, I was told that it was vegetarian broth. That totally stinks.